Lately, I've been taking on multiple projects left and right, either for the wedding or our new apartment. The quote "Would you like to dance around the world with me?" is from one of our favorite Dave Matthews songs, which kinda holds a special place for Josh and I. 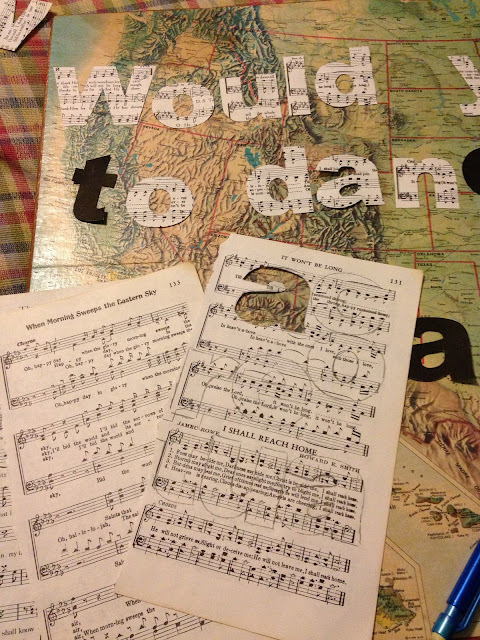 With our love for good music and traveling, I was dying to incorporate a vintage map and some paper from an old hymnal. I printed out the quote, cut out the letters, then traced them onto the old hymnal paper. Finally, I modge podged each letter in place. Hi - I'm obsessed with this. OBSESSED!